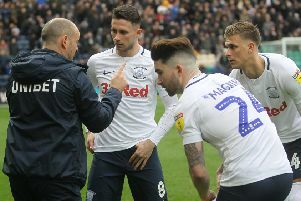 Alex Neil felt his Preston North End side being quick out of the blocks was key to their 3-1 win over high-flying Norwich City on Wednesday night. Declan Rudd then saved a penalty just after the half hour with PNE having to withstand plenty of pressure early in the second period. Sean Maguire made sure of the three points 20 minutes from time, Neil’s men extending their unbeaten run to six games and knocking the Canaries off top spot despite Teemu Pukki pulling a goal back in stoppage time. “I think our start was crucial,” the North End boss said. “To press and harry and get after them as much as we did was always going to be difficult to do for 90 minutes. “The most pleasing thing was we got the early goal, then got another and made them change their shape. “They then got a penalty and to be honest I thought both were right. “Them missing their penalty was a big moment in the game because if they got that goal their tails would have been up. “They were brave in the second half but it’s easy to do that when you’re at the top of the league and losing 2-0. “Naturally we were going to come under pressure and have to defend well and then the next goal was always going to be the deciding factor.